From the Cumberland Gap to the Atlantic Ocean, this is Virginia Water Radio for the week of October 7, 2013. This week, we feature another water-sound mystery. Have a listen for about 20 seconds, and see if you can guess what widespread water-resources issue happens every time you hear sounds like these. And here’s a hint: if the answer doesn’t seep in, it’s all downhill from there. 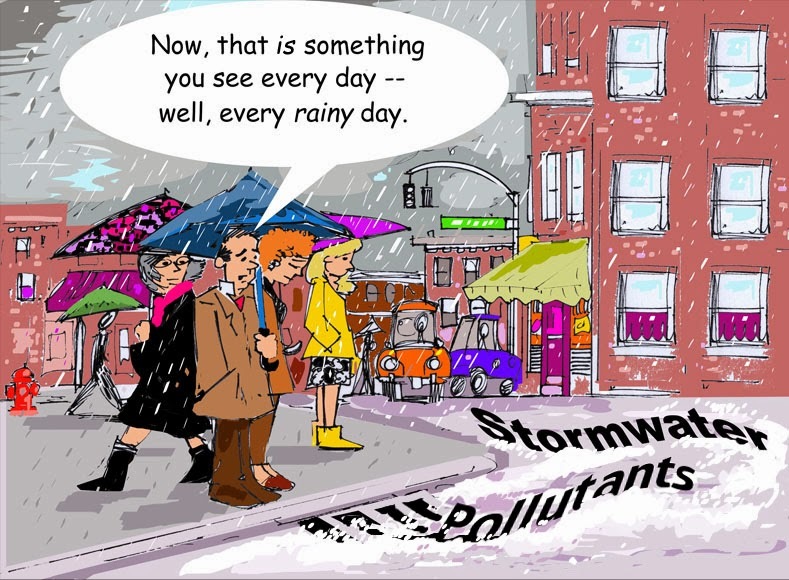 If you guessed stormwater, you’re right! The obvious thunderstorm sounds were followed by the sound of water flowing through a storm-drain pipe on the Virginia Tech campus during a rainy October morning. 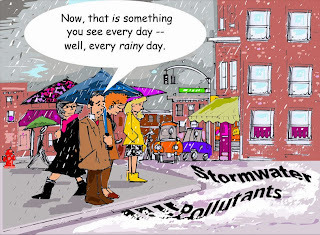 Stormwater is rainfall or snowmelt that can’t seep into the ground, or infiltrate. Water that can’t infiltrate flows over the land surface directly into water bodies or into drains and pipes that eventually lead to water bodies. During that overland flow, also called runoff, stormwater can pick up soil, trash, chemicals, pet waste, and other potential water contaminants. Along with these water-quality impacts, flooding and erosion from increased stormwater quantity are issues in developed areas, where removal of vegetation and the placement of pavement and other impervious surfaces significantly increase water runoff. Such impacts, and the federal and state laws and regulations implemented in response, have made stormwater-management a costly and far-reaching water issue, affecting developers, industries, agriculture and forestry, local governments, and homeowners. Stormwater-management pond on the Virginia Tech campus in Blacksburg, June 28, 2010. 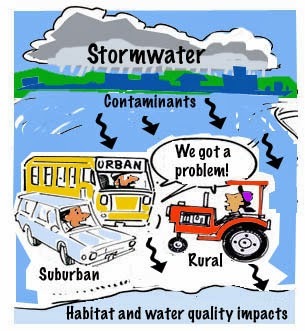 Cartoon by George Wills of Blacksburg, Va. (http://www.etsy.com/people/BlacksburgArt), originally published “Wherever You Are, Stormwater’s On Your Street,” Virginia Water Central, August 2010 (pp.3-5), http://vwrrc.vt.edu/watercentral.html. Cartoon by George Wills of Blacksburg, Va. (http://www.etsy.com/people/BlacksburgArt), originally published in the “Focus on Stormwater, Virginia Water Central, September 2006 (pp. 11-12), http://vwrrc.vt.edu/watercentral.html. Acknowledgments and Sources: Part of this week’s script was taken from “Wherever You Are, Stormwater’s On Your Street” and “Stormwater Information Sources,” both by Danielle Guerin in the August 2010 issue of Virginia Water Central (pp. 3-7), online at https://vtechworks.lib.vt.edu/handle/10919/49363. 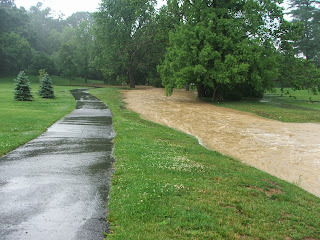 Information on stormwater and its management and regulation was taken from the U.S. EPA, "NPDES Stormwater Program, online at https://www.epa.gov/npdes/npdes-stormwater-program, and the Virginia Department of Environmental Quality, “Stormwater Management,” online at http://www.deq.virginia.gov/Programs/Water/StormwaterManagement.aspx.